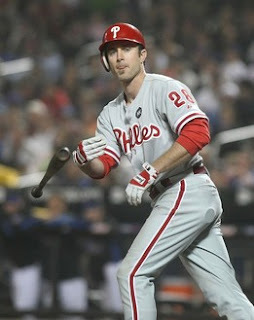 Throughout the month, Phillies Nation will be counting down the Top 25 Phillies Moments of 2009. Before we really knew the extent of the Mets woes, the Phillies locked horns with their neighbors to the northeast during a seemingly important three-game set in mid-June. At that point, the Phillies sat just two games ahead of New York for the NL East lead. This game would serve as a back-breaker of sorts for the Mets, who would end the month 20 days later nine-and-a-half games out of first. For six innings, the Mets offense played small ball, giving right-hander Mike Pelfrey a 4-1 cushion to work with. Pelfrey helped his own cause in the fourth by singling in a run, the first of three to cross the plate for NY in that frame. Names like Omir Santos and Alex Cora were doing damage with the bat, while Pelfrey held his own on the hill. Going into the seventh inning on June 10, Pelfrey stymied the Phils, going six strong while allowing just one lone run on a Chase Utley solo jack in the fourth. In that fateful seventh, Pelfrey would get lifted after the first three Phillies reached base, all via singles. They would all touch home, locking it up a four apiece. The bullpen’s then combined to take the game into the 11th, paving the way for a spot in right field to be adorned with a new moniker. New York turned to Bobby Parnell in the 11th, following two shutdown innings by Francisco Rodriguez. On the second pitch from the new reliever, Chase Utley smashed the delivery about six rows deep into the bleachers for his second shot of the game. The homer put the Phils up 5-4 and in the process, “Utley’s Corner” was born. Two weeks later, with the Yankees visiting Citi Field, Brett Gardner blasted a ball into the same section as the Utley home run, prompting Mets announcer Gary Cohen to say: “Gardner lifts one down the right field line, back toward Utley’s Corner, near the wall…it’s outta here!” The rest is history.